P.C.Q. PRO features the active ingredient diphacinone. This first-generation anticoagulant rodenticide has a broad label for use against a wide variety of pests in industrial, commercial and residential accounts, including California ground squirrels and commensal rodents. It is a restricted-use pesticide (RUP) that is approved for burrow baiting for meadow and pine voles. P.C.Q. 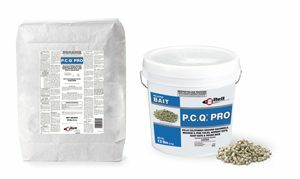 PRO is formulated with Bell’s proprietary preservation system, yielding a pelleted bait that is both palatable and flexible for a variety of applications. It is available in 12-lb. pails or 50-lb. bags.